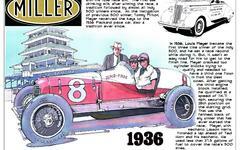 I had the good fortune to have lunch with Johnny and Betty Rutherford at the Indianapolis Motor Speedway today. I met them in 1997 when I was running the Nortel sponsorship of Scott Goodyear at Treadway. Aside from their always gracious company, Betty told me something I had never heard before about Speedway history.